Is your marketing content heavy on the text? Or graphics? If it’s the former, you might want to change your strategy. Today’s marketing content, whether in print or electronic media, is increasingly heavy on the visual content. Here are five facts supporting the importance of graphics and images that every marketer ought to know. 1. Ninety-three percent (93%) of communication is non-verbal. 2. Ninety percent (90%) of the information transmitted to our brains is visual. 3. People only remember about 20% of what they read, but as much as 80% of what they see. 4. More than half (55%) of website visitors spend less than 15 seconds actively reading text on the page. 5. Social sharing more than doubles when images are used. According to the infographic from HubSpot, the average number of Facebook shares of posts without images is 28. With images, the average number of shares jumps to 65. 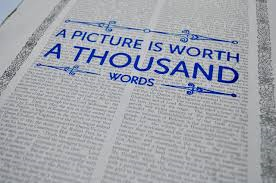 Without images, the average Twitter shares is ten. With images, it jumps to 20. Strong, powerful graphics are critical to any print marketing program and can make the difference between your message being noticed and remembered and not. Need help finding great stock images to complement your print and electronic marketing? Let us help.